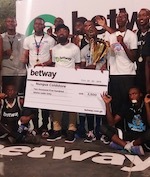 Defending Universities, Polytechnics and Colleges (UPAC) Basketball Championship winners University of Ghana (UG) just put together an unbeaten run to top Zone 8 and qualify to the quarterfinals of the 2019 UPAC. 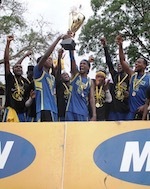 UG won all three games to clinch another zonal title. The team beat Regional Maritime University 49-25 after struggling to piece together decent plays in the opening minutes of the opening game. However, UG recovered to hit Ghana Institute of Management and Public Administration (GIMPA) hard via a 71-2 win. In the final between UG and fellow unbeaten side Central University, UG secured a 35-17 win to secure maximum points and win the zone. After a flat first quarter UG led 2-3, the three time UPAC Champions turned on the style and converted from three point range pull away in the second half. Central placed second to miss out on the quarterfinals despite the team's improved performance and Regional Maritime ended in third place after beating GIMPA 19-9. GIMPA ended the campaign without a win in three games. UG completes the list of quarterfinalists in this year's competition and has the chance to fight for a fourth straight title later this month. Quarterfinal games are scheduled for Friday, April 12 with the final game slated for April 13.